Forum Index > Historical Arms Talk > Swords in the late 18th through 19th century. Posted: Sat 12 Nov, 2016 4:24 pm Post subject: Swords in the late 18th through 19th century. Hello, a couple of months ago a friend called and asked me if I had ever been to a rendezvous. I answered no I had not and he informed me that is was an event in the American frontier days when all the "mountain men" and frontiers men would get together and trade. This intrigued me and and after going I loved it! My friend and I are planning taking it up and doing the reenactment part. Due to my interest in swords I was immediately curious about including this element. While I am aware that guns were largely replacing swords for military and civilian use by this period, I am curious, by the mid 19th century how common were they? Would folks have walked around carrying a sword? Or would that have been super out of place? If so what kind of swords would have been carried? Would basket-hilted sabers such as might be found on a Civil battle field have been carried? or something else? Had the sword been completely abandoned for civilian use in favor of guns or large knives? Any information on the swords and carry habits of this period would be appreciated! Mark is pretty much correct. Civilians didn't carry swords on a daily basis, or much at all by the mid-19th century. With the advent of percussion cap muskets and rifles, which had a faster rate of fire (and more dependable, too), a good Bowie knife or such was all the backup one needed. The military still issued swords, particularly to cavalry, but most were more dress or ceremonial than a real battlefield tool. During the Civil War, many soldiers discarded their brass-hilted short swords and sabers altogether rather than lug them around on campaign. Truly, by the end of the 18th century, swords as back-up weapons had had their day in countries using modern firearms, and civilians were more apt to emulate the weapons of their military than not. 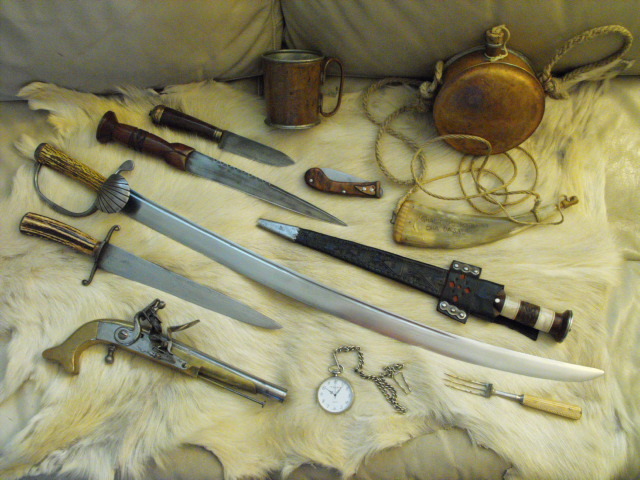 The American Fur Trade era in particular did not really need swords for civilian or hunting use, even though European hunters still had "hunting swords" carried as a side arm for boar hunting (which were mainly used to dispatch a wounded animal, as opposed to being a self defense weapon).